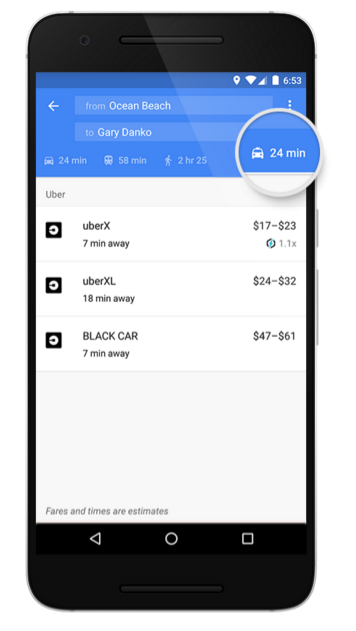 Starting today, users of Uber can simply open up the Google Maps app, plug in a destination, then get detailed information on whether an Uber is the best option for you to get somewhere. Usually, if you want to use Uber, you must open their app, hail a car, type in your destination, then you will be on your way. 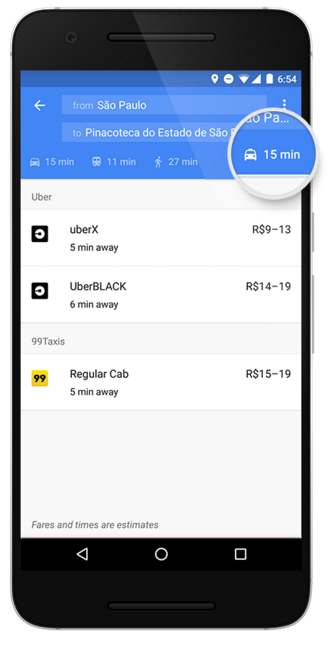 With this ride service integration in Google Maps, a newly dedicated tab specifically for ride services will show you estimated time to your destination, as well as the cost for the different tiers of Uber service. This is in addition to the other ETAs the Google Maps app provides, such as public transportation, walking, and biking. In the US, Uber riders can choose between uberX, uberXL, and uberBlack Car, all of which will estimate the cost of how much your trip will be. If you decide to choose one, a single tap takes you into the Uber app and hails your ride. For anyone outside of the US, Google is implementing other ride services, and taxis, into this tabbed area. Services will be available such as 99Taxis in Brazil, Ola Cabs in India, Hailo in the UK, mytaxi in Germany, and Gett in the UK. Google is rolling this feature out starting today and over the next week. For iOS users, it’s coming soon.